We lucked out with the weather on this popular meet. 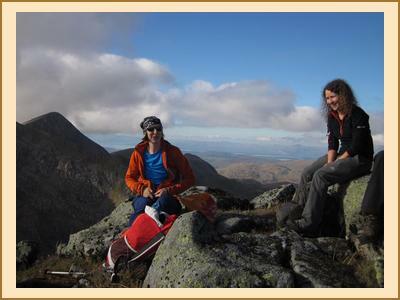 On Saturday a large group including two PNM's Alex and Kasia headed for Ben Cruachan, Stob Diamh and various Munro tops with multiple cars making a traverse possible. Glorious autumn weather made for some amazing views with some unexpected hoared and verglassed rocks to negotiate descending the first Munro top, Meall Cuanail. Some bad words may have been uttered as several people fell foul of the slippy rocks. Thankfully the icy rocks only extended for 100-200m and then we were back in the sun once more. Some debate was had re. whether it was quicker to go to the Stob Dearg by ascending Cruachan or by traversing the coire and thus the group split in two with the more/less sensible taking the respective routes. The traversing party arrived first on Stob Dearg but only by a few minutes. After some refreshments on Stob Dearg Martin and Fiona R decided to destroy some mountain art (Mr McNeish would have been proud of us!) by playing coconut shy with towering cairn that someone had built. We were met with a few disapproving looks however, the next storm would have knocked it over anyway and it was quite fun lobbing rocks. We continued back over Ben Cruachan and then onto Stob Diamh where the party split with the Munro top baggers continuing over Sron nan Isean and the Corbetteers heading for Beinn a Bhuiridh with us all meeting up again at the cars. Other hills tackled on the Saturday including Ben Lui and pals with everyone enjoying the rather good weather. After a socialable night first of all in the Ben More Lodge where a number of us ate (damn good food) and then afterwards in the hut (the overflow group from the hostel joining in for both) we woke to another great day so more hills were on the agenda. 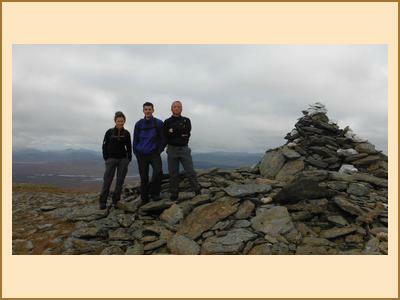 Mike, Fiona R and Alison C headed for Cruach Adrain's Stob Garbh top. Alison sensibly headed back over Cruach Ardrain with Mike and Fiona descending to the glen then back via Meall na Dige, Stob Binnien and finally Ben More. Other hills climbed on the Sunday include Beinn a'Chreachain and Beinn Achaladair plus various others.